I've used Google maps to show the modern-day locations of various troop positions and fortifications from important battles and sieges. Switch between satellite, terrain or Google Earth views using the tabs provided. Work-in-progress. I'm particularly interested hearing about any skirmishes/acts of violence/destruction often overlooked, little known or recently discovered. You've heard of the Royal Oak. But where else did the fugitive Charles II hide on his c.400 mile journey after the Battle of Worcester? Parliamentarian controlled v Royalist and privateer ports. The 'lines of communication' erected in 1642/3. Locations of skirmishes, garrisons and other notable sites. 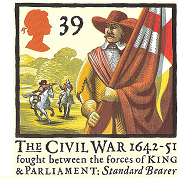 From raising his standard as Charles I's deputy in Scotland in Aug 1644 to capture and execution in 1650. Duly added! The Old Newcastle Project looks really interesting - will keep an eye out for further developments. Cheers. Cheers - will add in to the master map. Hi - I am looking for any references to seiges on Witton Castle in County Durham. We have an old pub, the Red Lion in North Bitchburn which is located in a small settlement on a ridge above Witton Castle - it is reputed to have the ghost of a Cromwellian Soldier. The pub is old enough to have been a stopping point for travellers - any thoughts?